(4XL) BIG MAN Vintage 60s/70s Shirt! Golden Yellow, Orange & Brown Plaid! Loop Neck Collar! 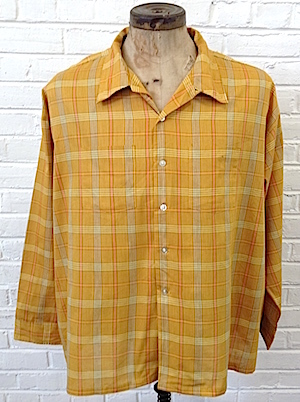 Home > Men's Vintage Shirts > Men's Vintage Shirts: 50s-60s > (4XL) BIG MAN Vintage 60s/70s Shirt! Golden Yellow, Orange & Brown Plaid! Loop Neck Collar! BIG MAN vintage late 1960s/ early1970s shirt. 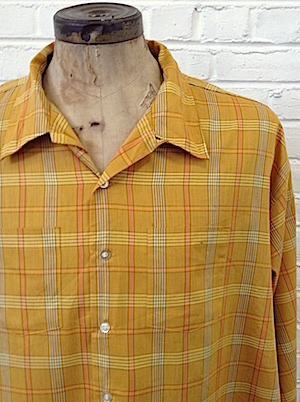 This fabulous shirt comes in golden yellow, orange, pale yellow and brown plaid . Has a wider collar with a loop neck collar. Closes in the front with pearly white buttons with one matching button on each cuff. Shirt has two chest pockets and a straight hem. Tagged by JC Pennys. Polyester/Cotton blend.